Training is relationship counseling. No, we are not going totally nuts here, but as it is Friday, a little more lighthearted post won’t hurt! 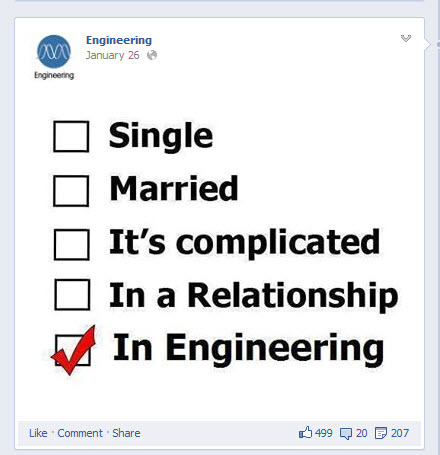 While doing my regular social media check this morning, I ran into an image on the Engineering page on Facebook. If you are using Facebook, you will recognize it. On your profile, you can enter your relationship status – married, single, etc. Who feels like they are married to their jobs? Who cannot stop thinking about your work or take their work to bed at night? Who sometimes fights over little, daily tasks? So if you compare being in engineering to being in a relationship, then what we do on the training side is truly relationship counseling, as we help you to reduce the daily hick-ups and have your work run smoothly.